Phase 3 of Marvel's Cinematic Universe officially got underway with Captain America: Civil War earlier this month, and now the focus is shifting to other films on their slate. One of the more anticipated entries is Guardians of the Galaxy Vol. 2, which will see us rejoin Star-Lord & co for another space adventure. 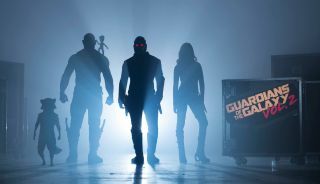 Kurt Russell is part of the sequel's cast, and after wrapping filming earlier this week director James Gunn and Chris Pratt took to social media to share how much they enjoyed working with the veteran actor. When you add these messages to the numerous (and hilarious) set videos, the Guardians Vol. 2 set looks and sounds like a really fun place to work. Here's hoping that comes through in the film when it's finally released next year. Directed by James Gunn and starring Chris Pratt, Zoe Saldana, Dave Bautista, Karen Gillan, Michael Rooker, Kurt Russell, Bradley Cooper, and Vin Diesel, Guardians of the Galaxy Vol. 2 will hit UK cinemas on April 28, 2017 and open in US theatres on May 5, 2017.